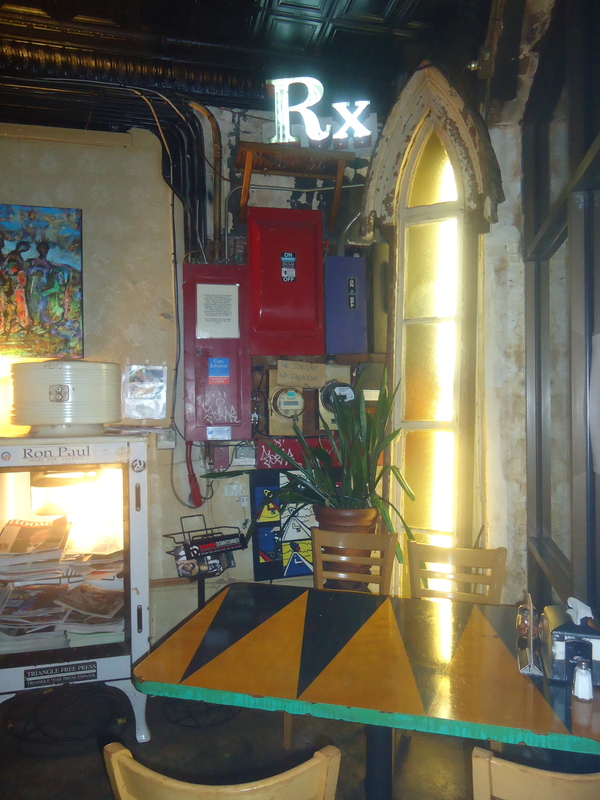 The décor at Lilly’s Pizza is funky and will definitely grab your attention the moment you walk inside the dimly lit restaurant. Honestly, what other restaurant in Greater Raleigh has a plastic Santa Claus sitting on their counter year round? The antiques come from all over Raleigh, including downtown’s Father and Son Antiques and estate sales. Lilly’s Pizza houses a window from the oldest African American Church on New Bern Ave. in Raleigh, which was built in 1852. The restaurant has also collected unique items from places outside of Greater Raleigh. 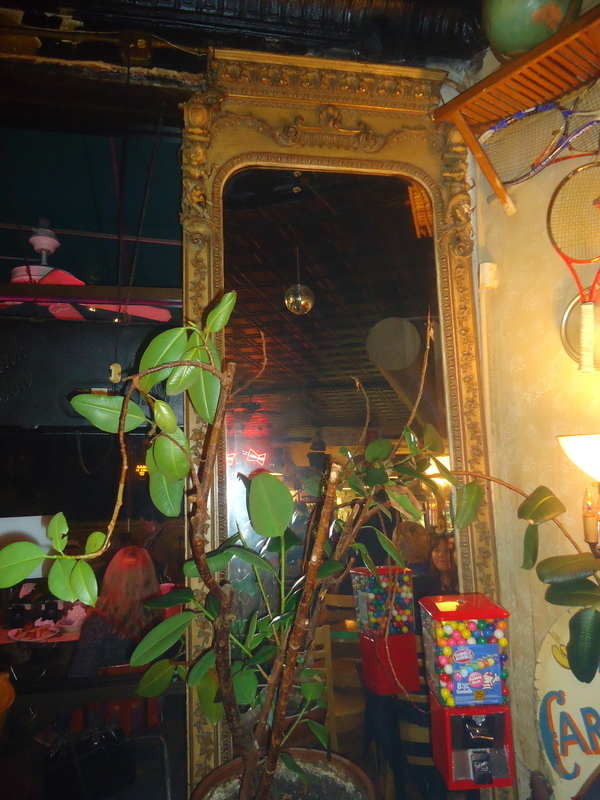 You’ll find an antique mirror in the corner of Lilly’s from a 19th century home in downtown Manhattan. Food standards are taken seriously at Lilly’s Pizza. 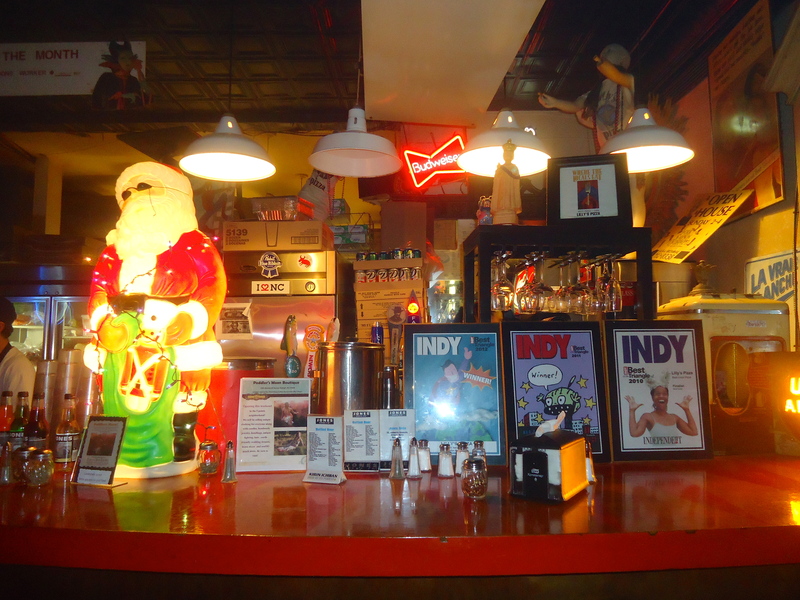 An eclectic group of people ranging from a family of four to punk rockers have made Lilly’s Pizza their home since 1993. Three musicians originally opened the restaurant as a delivery and carryout pizza joint in the space of a former biker bar. People from the surrounding neighborhoods started bringing lawn chairs to Lilly’s Pizza to socialize and enjoy pizza pies. Over time, Lilly&apos;s Pizza transformed into an actual restaurant with tables and chairs. The restaurant is still locally owned and continues to produce a product that is time-tested and true. The people of Raleigh also agree. Lilly’s Pizza has won Spectator and Indy awards for the best pizza in the Research Triangle Region from the beginning. 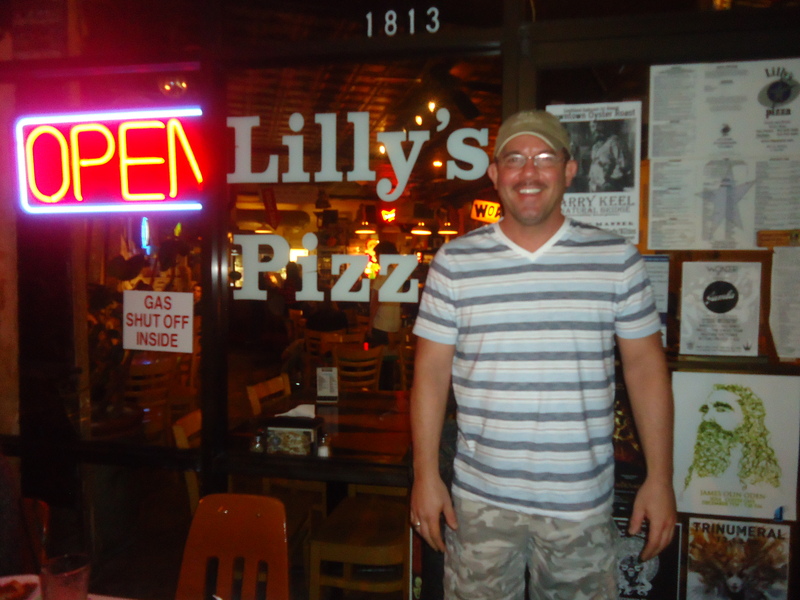 Jon Garrison is now the owner of Lilly’s Pizza. He is serious about buying local and organic ingredients for his restaurant. Since 1993, Lilly’s Pizza has been using certified organic, whole wheat flour from Lindley Mills in Graham, North Carolina. Jon frequents the farmers market where he met the owners of Melvin’s Gardens in Wake Forest, the supplier for Lilly’s Pizza’s fresh herbs. No wonder the certified organic tomato sauce is so flavorful! All of the vegetables are sourced from Blue Sky Farms in Wendell and are mostly organic. Jon prides himself on providing a product to his customers that is locally sourced and delicious. The restaurant takes the extra step to support farmers and give back to the community. They even support the North Carolina beer industry. I’ve had a few Lonerider Sweet Josie Browns and Duck Rabbit Milk Stouts during my numerous visits to Lilly’s Pizza. Jon understands the challenges of being vegetarian and vegan. He was vegan for one year and vegetarian for about six years. Jon estimates that over half of his customers are vegetarian or vegan. With eight vegan pizza sauces and over 40 vegan toppings, no wonder the clientele frequents Lilly’s Pizza. Not only is Lilly’s Pizza cognizant about vegetarianism and veganism, but the restaurant provides gluten free pizzas made from Bob’s Red Mill flour. 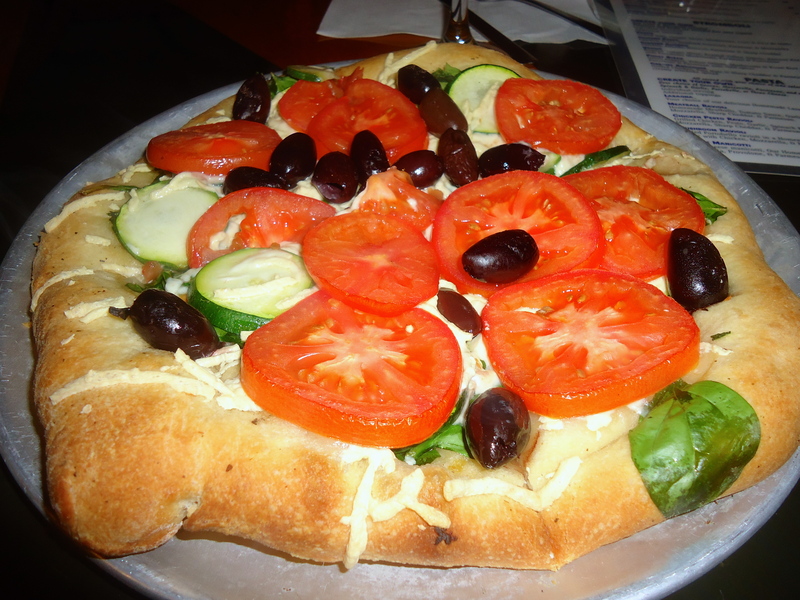 One of Jon’s favorite pizza pies is The Aristocrat because of the flavor of the roasted vegetables. This vegetarian pizza pie is made with high quality, extra virgin olive oil, roasted garlic, cremini mushrooms, sharp cheddar, mozzarella, roasted organic tomatoes, roasted organic yellow onions, roasted potatoes and parmesan. Mr. Green Jeans is another great vegetarian option with a plethora of fresh, organic vegetables. The best part about Lilly’s Pizza is that any vegetarian pizza pie can be made vegan. Customers can request their pies, as well as the calzones and stromboli,s to be made with Daiya vegan cheese. I ordered the vegan Buddha pie, which includes extra virgin olive oil, roasted garlic, baby spinach, sharp cheddar, organic tomatoes, organic zucchini, kalamata olives and Daiya vegan cheese. I’ve never eaten vegan cheese on a pizza and I was shocked! I couldn’t tell a difference. If you’re not in the mood for a calzone, stromboli or pizza pie, Lilly’s has other healthy options. Their salads are massive and sure to satisfy your hunger. The most popular salads are the Bantam Weight and Red Hot Rooster. Jon’s favorite is the Spinach Salad with ginger soy dressing and homemade croutons. The Roasted Veggie Salad and the Tofu Salad are great vegan options when requested without cheese. All of the dressings are homemade and many are also vegan. Pair a salad with a bruschetta appetizer and you have a delicious meal. The bruschetta includes five pieces of Lilly’s dough topped with a homemade sundried tomato pesto, fresh mozzarella, organic tomatoes and fresh basil. You’re encouraged to be creative at Lilly’s Pizza. With over 70 pizza toppings, you can honestly come up with any pizza pie! Jon has customers who order pizza pies with sardines and mandarin oranges. Give Lilly’s Pizza a try next time you’re at Five Points in Raleigh. I guarantee you’ll be back!